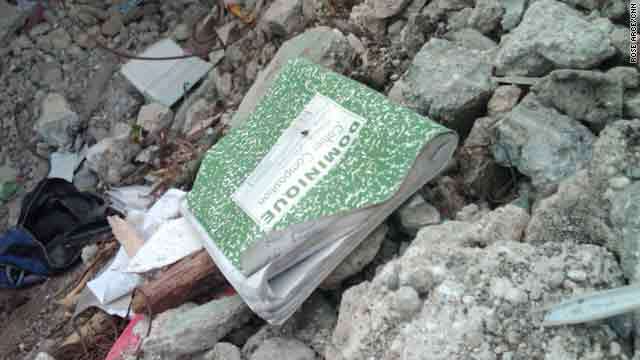 A music book left in the quake's rubble is emblematic of the loss felt by Jacmel, Haiti's cultural center. Jacmel, Haiti (CNN) -- Much was lost in the town of Jacmel, Haiti's cultural center. The nation's only film school has lost two buildings. The huge, colorful paper mache floats for Carnival, just 10 days away, are crushed. The mountains of sheet music for the classes at Ecole Musique are scattered in the rubble of a street named La Berenthe, the labyrinth. It's estimated 10 percent of the town's residents have perished. And with them they took a country's film festival, its music studios, the paintings and masks that draw tourists and Haitians to this seaside town of 40,000. Left behind are crushed limbs and brain injuries, nursed in an open-air hospital that replaced the real one. Cuban doctors had been working with Haitians when the earthquake hit, and they have continued their collaboration outside. "Where there is life, there is hope," says Dr. Silda Del Torro of Cuba while standing over a 4-year-old girl who has drifted in and out of consciousness. Del Torro says the head injuries are very hard to treat under these conditions, and she worries they will be left with crippling injuries, or worse. The doctors working in the open air also fear they have reached the limits of their abilities. They aren't orthopedists or anesthesiologists, and some patients with crushed limbs are developing gangrene. There are surgeries that need to be done. This seaside town is just over an hour's drive from the epicenter of the earthquake. It has an airport and a port that bring in tourists. But much of the growing international relief effort has been focused on Port-au-Prince until now. The residents dug out trapped neighbors largely on their own for days. But intrepid Jacmel residents got out word they needed help through the Internet, texts, Facebook and YouTube. The Cine Institute was left homeless, but its young filmmakers pulled their equipment from the rocks and moved into a building next to the airport. They set up generators, powered up laptops and started moving visual images across oceans in a cry for help. "We just got the information out. Our filmmakers just went out and started shooting and sent it away even as their own families were being affected, their homes being lost," said David Belle, institute director. Their plea was heard, and Colombia rescue workers arrived just in time to pull a child from the rubble. The Chileans sent doctors. Sri Lanka sent security. The French assembled a clinic where parents had dug for a trapped child unsuccessfully for days. Canada brought in the big guns -- a Navy ship and Army helicopter with engineers and supplies. "We brought in light engineering equipment, drills, the jaws of life, anything that can be carried portably," said Robert Brown, a naval commander from Halifax, Canada. The United States joined the effort Tuesday, announcing they will fly in C130s with supplies that will assist the Canadians in making Jacmel's airport the center of the rescue efforts to southern provinces not touched by the aid sent to Port-au-Prince. But this town needs so much more than just immediate relief. The days without aid wore down their psyche and hampered relief efforts. "We could have saved so many more people with these guys," remarked a film student as he watched the French set up tents and begin treating a growing line of wounded. Yards away, a teenager music student searches for his flute in the remains of his flattened house. So many of the colorful buildings are crushed and damaged. So much of the artistry that made Jacmel special is gone.